today I came home early from work and lazed around for a while.. it was one of those days when you feel like just Chai is not enough to help you get through the day - I desperately wanted to eat something chatpata and tikha.. Source: This is a combination of recipes from Aai (my Mom) and Shilpa - my SIL. I like to roast the corn before removing the daana. But this may not make much difference..
Take roasted or normal corn ke daane in a mixing bowl, add all ingredients except for besan and mix well. Taste this mixture and make it as tikha or salty as you like. Heat oil for deep frying. Use one spoonful of the pakoda mixture at a time and deep fry till golden brown. 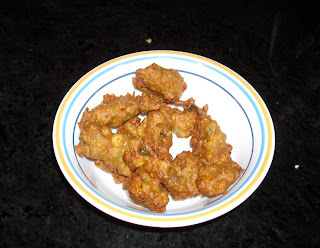 These pakode taste really yummy with 'Tomato Saar'..